This page contains pictures and information about Eucalyptus Tip-wilter Bugs that we found in the Brisbane area, Queensland, Australia. 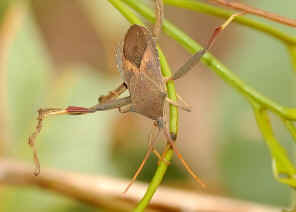 The bugs are also known as Gumtree Tip-wilter Bugs. Quite a number of bugs in this tribe Amorbini can easily be found in Brisbane. However, some of them look similar and hard to be identified. They are mostly from 10 to 25mm in body length. 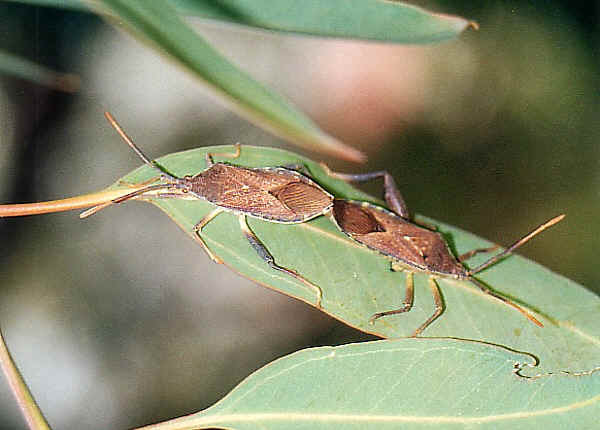 Majority of species in this tribe are commonly known as Eucalyptus Tip Bugs. Most look very similar. They are large, robust and brown in colour. 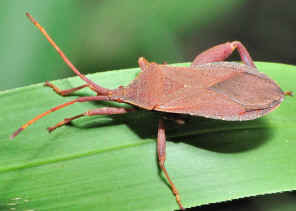 They have orange-red banded body covered with brown wings. 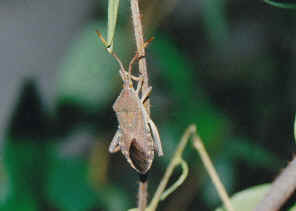 Males have shouter hind femora and spiny hind legs. They do not have the lateral angles on the pronotum. They feed on new shoots of Eucalyptus trees. Their nymphs are variable mixed bright colours. Above picture shows a mating couple. From the reference information the copulation time last up to 10 hr in an end-to-end position. They are active on hot sunny days. Nymphs can be seen on early summer. There is one generation per year. 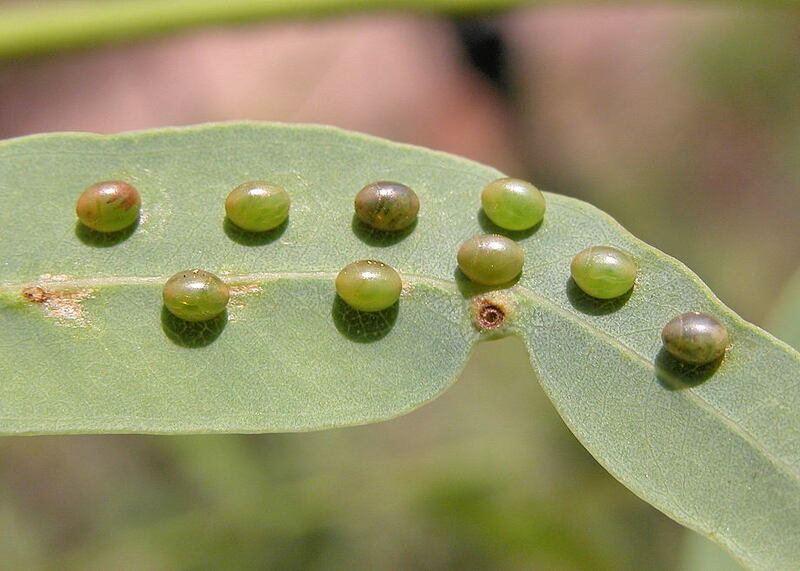 Eggs are laid singly on the leaf surface of young leaves and usually several eggs laid close together. There are five nymphal instars stages. The Eucalyptus Tip-wilter Bugs are dark brown in colour with light brown and orange on the legs and antennae. The are the alternated brown and yellow along the edges of the abdomen. 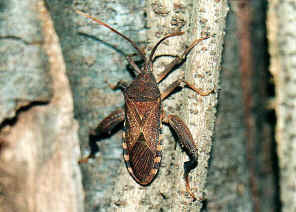 Males have shouter hind femora and spiny hind legs. 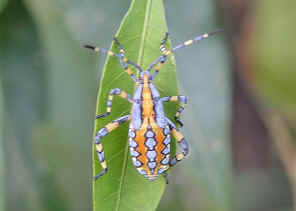 Nymphs are colourful yellow-pink with bright blue patterns. More information please click on here. We found the bug adult once in Mt Coot-tha on March 2010. The bug was found on long-blade grass. 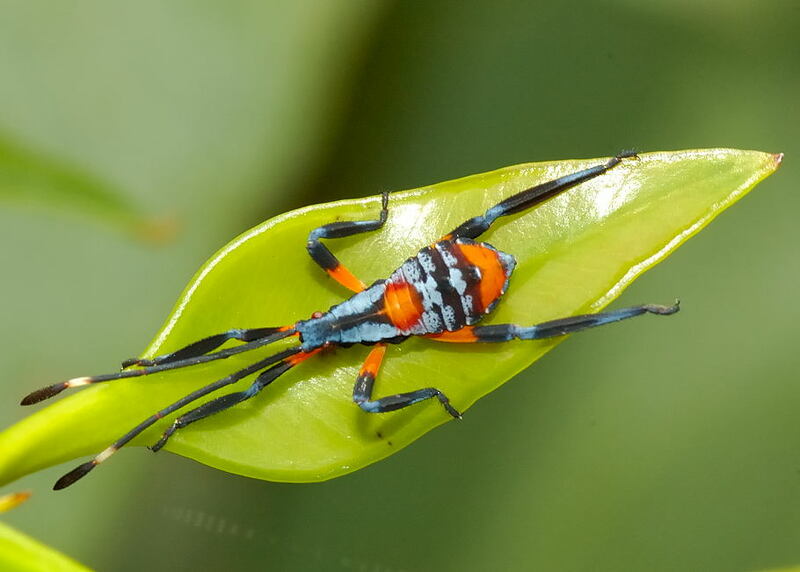 The first two nymphal instars of this species are green and black and the last three are orange and black. Please check this page for more information. This the the most common Amorbus species in Brisbane. 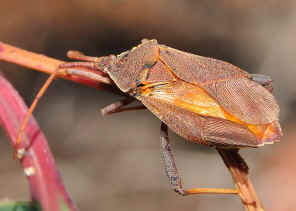 This large bug can be found from early summer to early winter. 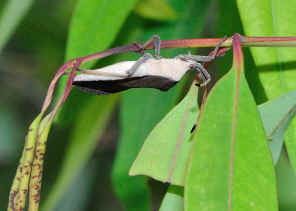 The adults usually found standing on the top or the young shoots of gum trees, with hind legs extended on both sides. They will not change it posture even if disturbed. 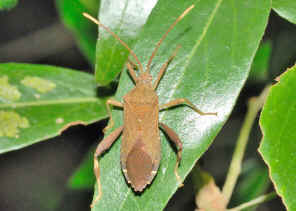 The bug is reddish brown in colour, with strong and spiny hind legs. We have detail information in this page. 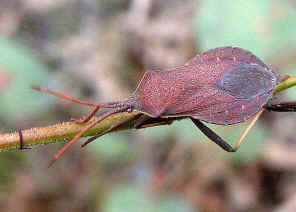 This bug was found on alone White Hill on Oct 2004. It was hanging upside-down on a gum tree new shot, mimicking a dry leaf remain of a wilted tip. 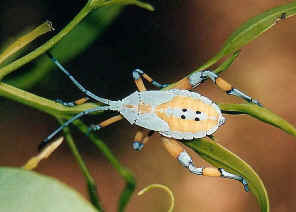 The bug has a round and flat abdomen. More pictures and information please click here. 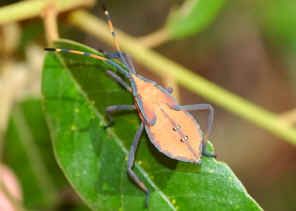 This bug was found in Ford Road Conservation Area on Jan 2009. 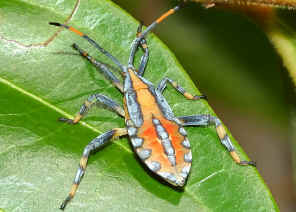 It has the white antenna tips and its hind legs are different from other Amorbus sp.. Please check this page for more infromation. 1. Insects of Australia - CSIRO, Division of Entomology, Melbourne University Press, 2nd Edition 1991, pp 503.